So swimsuit season is upon us, and lets just say I'm not ready and probably never will be (haha)! Give me all the one piece swimsuits and cover ups! I will have to say that one piece swimsuits have come a long a way and I couldn't be more thankful. When I saw this swimsuit I just had to have it!!!! Unfortunately, it sold out super quick, but I found one that is almost identical and the other that I can't wait to get my hands on! Summer is not usually something I look forward to since we live in triple digit heat most of the time. But having cute swimwear and accessories make it a little bit better. 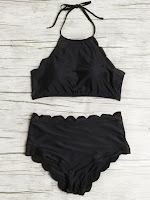 I am sharing four one piece swimsuits and cover ups that are on my current wishlist. I have also picked out some bikinis and can dream I will have six pack abs to one day where them, but they are super cute!! Everything is under $20! And FREE SHIPPING! Head over to She In and do some summer shopping. Remember to order a size up!